As Sherlock Holmes has himself noted, there is nothing new under the sun. 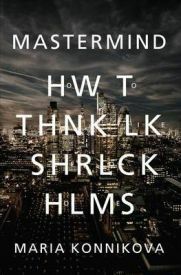 Mastermind: How To Think Like Sherlock Holmes by Maria Konnikova is far from the first piece of writing to join the worlds of the great fictional detective and psychology. We have had Holmes the addict, Holmes the man with Asperger’s, Holmes the man unable to form normal relationships with those around him. However, given the complexity and enduring appeal of Holmes, it is not perhaps surprising that he now is the hook on which Konnikova’s new book on the science of memory, creativity and reasoning hangs. He even influenced the release date: 6th January, Sherlock Holmes’ birthday. The basic premise of the book is that our minds work on two systems – one is quick to react and largely unconscious, while the latter is slower, more deliberate and rational. Konnikova dubs them System Watson and System Holmes respectively. We all have a natural inclination to use System Watson as much as possible, as it requires a good deal less time and effort; this, Konnikova argues, leads to us not observing things, coming to erroneous conclusions about the world around us, stifling our potential creativity and restricting the things that we can usefully commit to memory for future retrieval. If we can learn to use our System Holmes, she writes, we can improve how we use our minds. It is a promising premise to get us interested in her book – who wouldn’t want to be able to think like Sherlock Holmes? A spoilsport may wish to point out that Holmes was fictional and that many of his amazing deductions were because his author knew the answers to the puzzles he was solving, but as Sherlock was rooted in the real life observational skills of Arthur Conan Doyle and Dr Joseph Bell, I think we can forgive this point. Indeed, Konnikova is clearly very knowledgeable about the Holmes canon, quoting widely from across the stories that he appears in to illustrate her points. In some places she gets so deeply into the fiction that only fans of the books are likely to stay with her, but for the most part it provides as good an introduction into Holmes’ world as it does into psychology (and doesn’t include the spoilers that would stop the interested reader from going on to try the novels for themselves). As a blogger and science columnist of some experience (most notably for Scientific American), Konnikova is used to explaining complex scientific principles to a lay audience. This certainly comes across in her writing, which is clear without being patronising, and largely engages the reader well in the subject of discussion. Psychology is, however, a practical subject and the text also includes some examples of tests or thought experiments that you can try out for yourself to better understand the ideas covered. Unfortunately, the way these are presented leaves something to be desired. One visual puzzle had the answer printed on the opposite page, so by the time you had discovered what the puzzle set out in the first image was, you could not have helped but have seen the answer directly opposite. In another instance, a memory test is presented, with five sentences written one below the next on the page. We are asked to only read and commit each to memory for five seconds then imagine it has disappeared; we then see what we can recall at the end. But the sentence hasn’t disappeared, and I can see it in my peripheral vision as I am reading the next sentence down, so it isn’t really a very good test of my memory, is it? A simple website to accompany the book where all the tests could be properly presented would have served this text well; Richard Wiseman has done just this with some of his books and I think it enhances what you have read to be able to interact with tests and ideas online while you read. I think the next logical question was did l learn something from reading this book? Well, here is an example of me employing System Holmes. I note that on the front cover of the book, there is a prominent quote by the Harvard psychologist Steven Pinker, praising the contents. System Watson would perhaps have me take the quote as being a recommendation of the book, in effect judging it by its cover. System Holmes notes something on the press release that accompanied the book – Steven Pinker taught Konnikova when she was a student at Harvard – and comes to the quite logical conclusion that it may not be the most unbiased synopsis of the material within. Elementary! How To Think Like Sherlock Holmes was mostly an enjoyable read, and the way it splices the fictional detective with scientific ideas prevents it being just another psychology or self-help book. A lot of the ideas were ones that I had come across elsewhere, so my personal interest lay largely with how they tied into the fiction. It is a book that will appeal to a fairly wide range of readers, and would make a good gift for fans of the Holmes stories. Recommended for fans of Sherlock Holmes, less so for readers of popular psychology books. With thanks to Canongate for providing this review copy. No Comments on "Mastermind: How To Think Like Sherlock Holmes"